An impossible figure is a type of optical illusion. The geometry and its rules apply to the design allow us to represent what we see in such a way that the brain considers it similar to reality. This method also allows us to "trick" the eye and to represent objects or spaces in false prospects and make it "impossible". 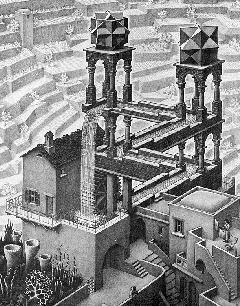 In 1958 Escher realized his first work dedicated to impossible figures: "Belvedere". In the lower left there is a boy holding an impossible cube and he does not realized that also Belvedere is based on the same structure. The cube that the boy holds in his hands is called "Necker's cube". Escher realized a lot of other works, always based on the impossibility. Among these we remind the "Waterfall", where the water falling from above starts operating a mill which drives the flow back to the top of waterfall; the "Up and down" where some people, maybe monks, are walking in a circular route but, if we look better, we observe that or they goes ever up or ever down. In this chess-board the chess, which should be in the same plan, are in two differents plans. For this is called "The impossible chess-board". In this triangle, called "Kanizsa's triangle, we can see a white triangle that it doesn't exist really. 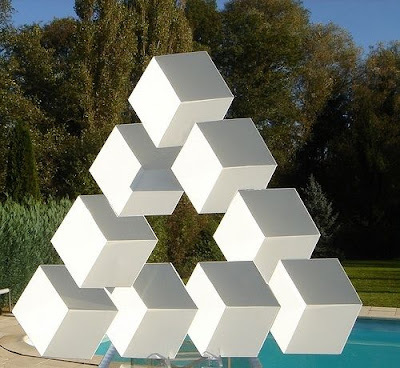 Swedish artist Oscar Reutersvärd was the first that designed many impossible objects. He has been called "the father of impossible figures". In 1934 he drew the Penrose triangle, some years before the Penroses. In Reutersvärd's version the sides of the triangle are broken up into cubes. In 1956, British psychiatrist Lionel Penrose and his son, mathematician Roger Penrose, submitted a short article to the British Journal of Psychology titled Impossible Objects: A Special Type of Visual Illusion. 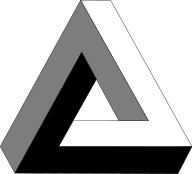 This was illustrated with the Penrose Triangle and Penrose stairs.The article was published in 1958. From the 1930s onwards Dutch artist M. C. Escher produced many drawings featuring paradoxes of perspective gradually working towards impossible objects. In 1957 he produced his first drawing: Cube with Magic Ribbons. He produced many further drawings featuring impossible objects, sometimes with the entire drawing being an undecidable figure. His work did much to draw the attention of the public to impossible objects. Several contemporary sculptors recently have taken up the challenge of creating impossible art. That is, they are interested in shaping real-world 3-D objects that nevertheless appear to be impossible. The “Elusive Arch,” by Dejan Todorović of the University of Belgrade, Serbia, shows a new impossible figure. The left-hand portion of the figure appears as three shiny oval tubes. The right-hand portion appears to be three alternating pairs of shallow matte ridges and grooves. In the 16th century, an Italian painter named Giuseppe Arcimboldo was on the cutting edge of his craft as he painted composite portraits of people using a variety of objects. Some of his most famous paintings involved creating portraits out of fruits and vegetables. 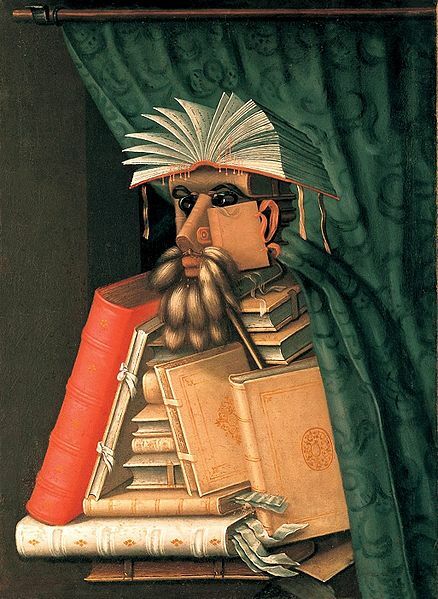 In his painting below, he uses books to represent the head and torso of a man. This sketch of endless staircase was painted by english bioligist Lionel Penrose in 1962. 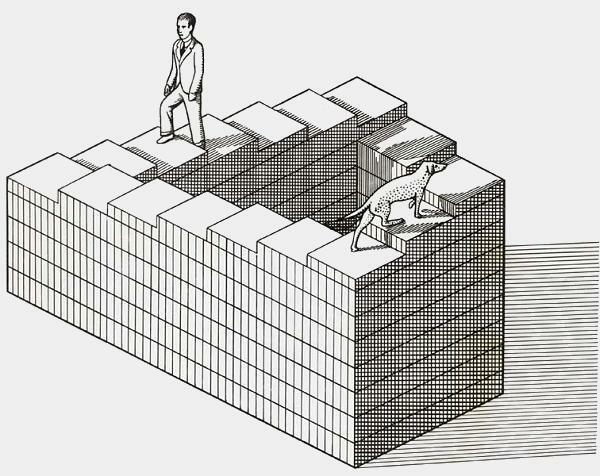 Earlier, in 1954 he and his son Roger Penrose published an article about impossible figures in the British Journal of Psychology, where they first described two basic impossible figures - the impossible triangle and the endless staircase.